The world’s first production V6 engine was created by Francesco De Virgilio of Lancia. It was an engine partly based on technological developments made in pre-war Lancia cars and in part designed to solve the problem of engine vibration of the shallow 17° V4 engines of such cars as the Lancia Artena. Early Lancia V4 engines were given quite elaborate engine mountings to ensure engine vibrations were not transferred to the car. These engine mountings involved mounting the engine on four arms each on coil springs on Silentbloc bushings. This assembly then being mounted on short leaf springs attached to the chassis. It was a system that proved very effective in damping out the engine vibrations but in the post war era Lancia wanted an engine that was smooth in its own right. Because a four stroke engine is most easily balanced if its cylinders are in multiplies of three Francesco De Virgilio decided to create a V6 engine that used the characteristic Lancia style common camshaft for both banks of cylinders. He also made the engine undersquare which allowed its capacity to be increased by simply increasing the bore diameter when required. 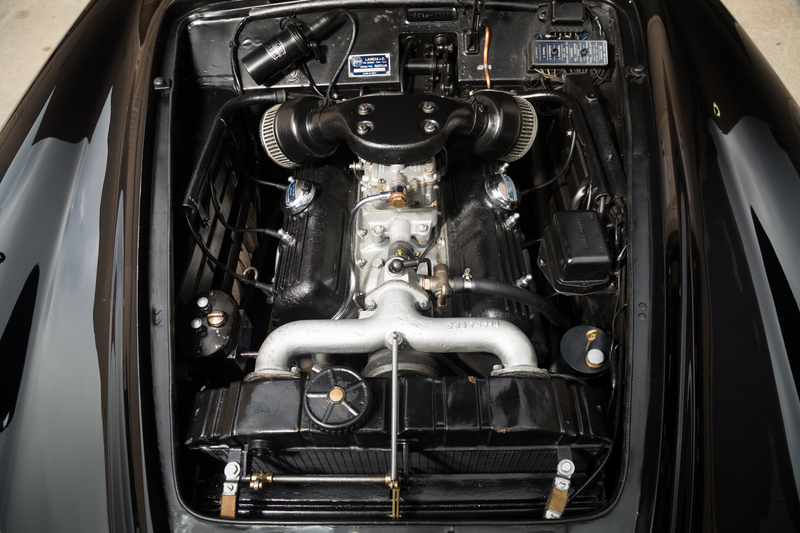 Francesco de Virgilio’s V6 engine created for the Lancia Aurelia and her successors is a well balanced unit with good torque and power balance. Whilst Francesco de Virgilio worked for Lancia during the war years and immediately afterwards from 1943-1948 the car that his new engine was to be the heart of was the creation of Lancia engineer Vittorio Jano and his team. Over its years as a motor car manufacturer Lancia had deservedly acquired a reputation for innovative design and thorough attention to detail, and in the aftermath of the Second World War they were determined to hold on to that reputation and build upon it. 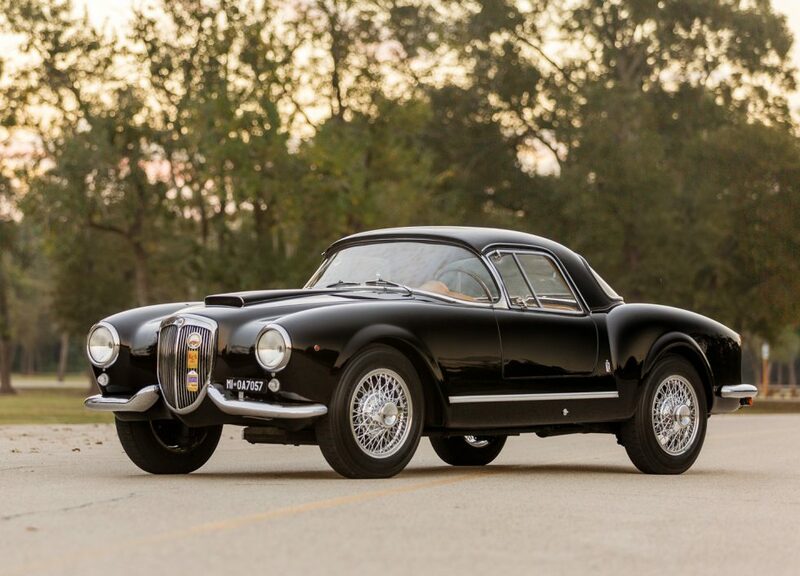 So although when we look at the pictures of the Lancia Aurelia B24S Spider America in this post we might be tempted to think this looks like an “old fashioned” car from the outside this outward appearance is deceptive. Underneath that sveldt but fifties style coachwork there sits ensconced a chassis and suspension that are advanced in their design and execution. Once we get the Lancia Aurelia up on a hoist we can begin to appreciate the novel yet practical design. 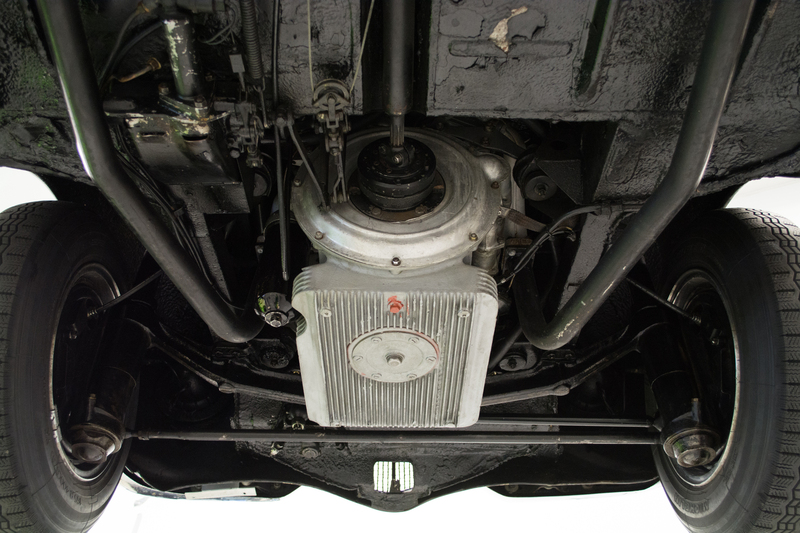 Underneath the Lancia Aurelia we find the engine mounted at the front but then a two piece propeller shaft to the rear mounted transaxle combining four speed gearbox and differential in one unit complete with in-board finned drum brakes. 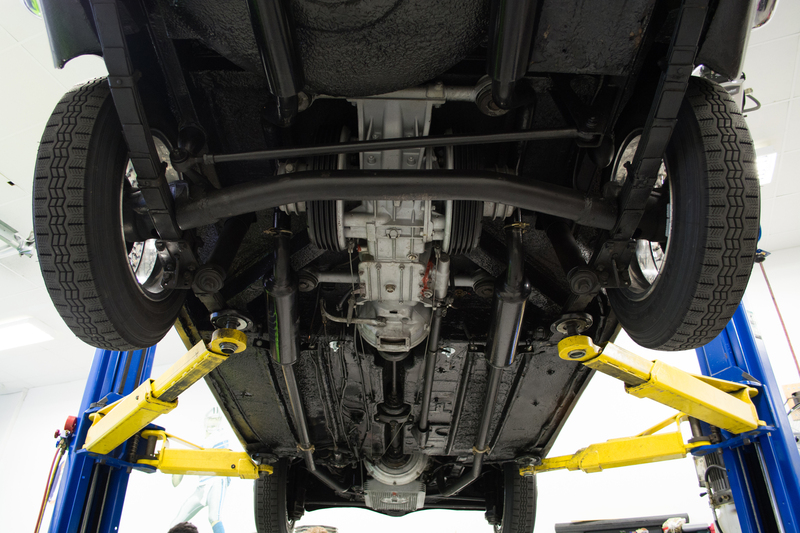 The rear suspension being by leaf springs and de Dion tube. The effect of this design being an even weight distribution between front and rear of the car and a significant reduction in unsprung weight with all the handling benefits that accrue from that especially on rough road surfaces. This de Dion tube independent rear suspension system was a feature of the 1955 Aurelia which is the production year of the Aurelia B24S Spider America in our pictures. Front suspension is by sliding pillars with outboard drum brakes. At the front the suspension of the Lancia Aurelia was by sliding pillars with the drum brakes conventionally located in the wheels. The Lancia Aurelia began production in 1950 and early models were four door “berlina” (i.e. sedan or saloon) with the modest engine capacity of 1754cc and producing 56hp and designated B10. The following year in 1951 an uprated B21 Aurelia was released with engine capacity enlarged to 1991cc and power increased to 70hp followed by the B20 GT coupé which was a two door designed by Pininfarina and with engine power increased to 75hp. Following on from that as we moved into 1952 the engine power of the Aurelia was increased to 80hp which was achieved by raising the compression ratio and modifying the valves. In the post war era and austerity years up until 1951-1952 gasoline quality would have required a lower compression ratio but as things improved Lancia’s engineers were able to raise the compression ratio and design the engine for better quality fuel. The Lancia Aurelia was created to be a driver’s car in every sense of the word whether the four door Berlina or the more sports oriented coupé. In 1952 the B22 Berlina (sedan) was introduced with dual Weber carburettors and a more performance oriented camshaft which caused that 1991cc V6 to churn out a respectable 90hp. In 1953 Lancia increased the bore of the V6 to give it a capacity of 2451cc and then in 1954 the rear suspension was changed to the de Dion tube arrangement as seen on the 1955 car in our photographs. 1954 was also the year that the B24 Spider was introduced and this car featured an 8″ shorter wheelbase than the four door. The B24 Spider was produced for the 1954-1955 model years and in total 240 were built. These cars have a wrap around windscreen and the stylish two piece front bumpers and were styled by Pininfarina. This 1955 B24S Spider America has a removable hard top. 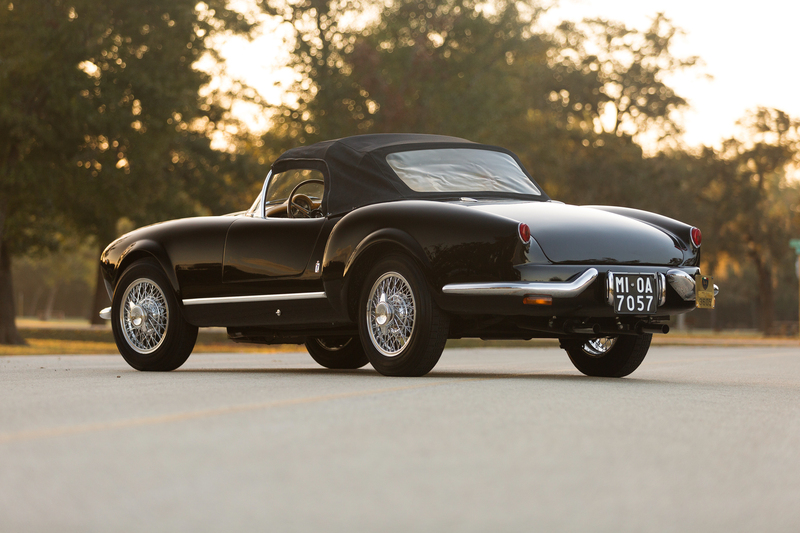 The black Lancia B24S Spider America in our pictures is currently up for sale with five days left on the auction at time of writing. This car was purchased new on 9th November 1955 in Torino and has been in collector hands since then. 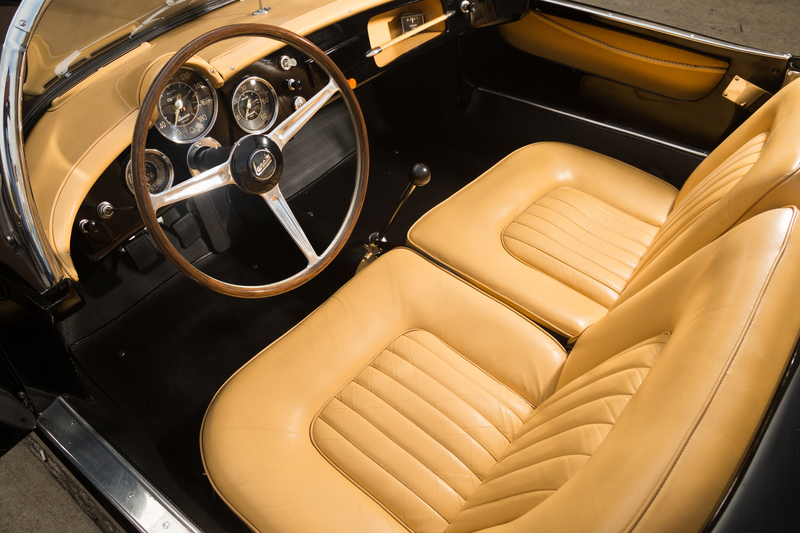 The car was subject to a restoration in 1980 when the body color was changed to black and the interior re-upholstered in light tan, a very attractive color combination for this vehicle. The car is being sold with a letter confirming its matching numbers and a Registro Storico production record, period Italian transport papers, and clean Texas title. 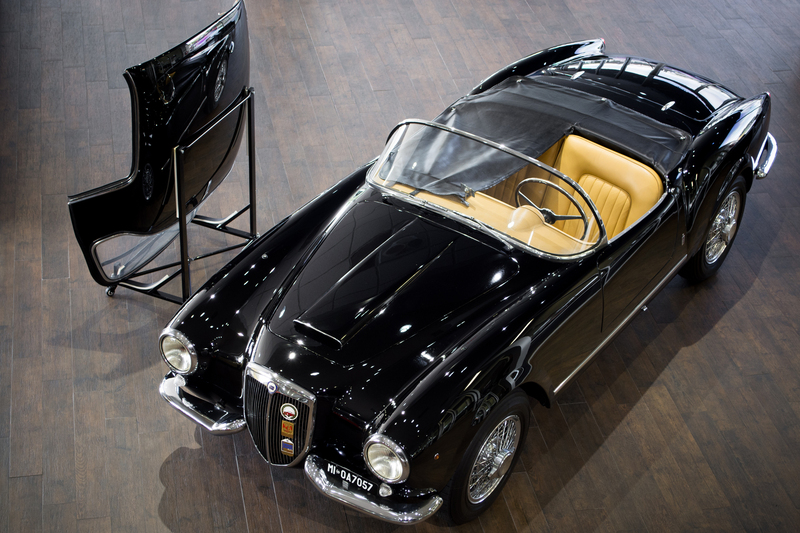 This Lancia Aurelia B24S Spider America’s Pininfarina styling is strikingly eye catching from every angle. This car was purchased with the optional Borrani wire wheels and the quite rare detachable hard top making this an unusual and desirable example of the 181 left hand drive cars produced. The car is currently being auctioned by Bring A Trailer auction but this one has no need of a trailer as it drives beautifully. You may of course prefer to have this car professionally transported if you successfully purchase it. The video below gives an impression of the sights and sounds of this delightful classic. (All pictures and video courtesy Bring A Trailer).